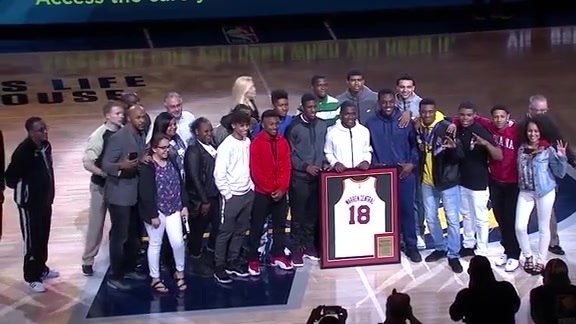 INDIANAPOLIS – Coaching icons John Wooden and Tony Hinkle, the Indiana Basketball Hall of Fame and its home city of New Castle, and the 2018 IHSAA boys and girls state championship teams will be the 2017-18 Indiana Pacers Hickory Night honorees, the Pacers announced today. The Pacers also will wear new white Hickory jerseys on the Hickory Nights at Bankers Life Fieldhouse, as well as during road games against the Los Angeles Lakers (Jan. 19), Boston (March 11), Philadelphia (March 13) and the Los Angeles Clippers (April 1). The white Hickory uniform, the Nike Classic Edition, is a modern take on the white uniforms of Hickory High as worn in the 1987 cinematic classic Hoosiers. This is the fourth new uniform unveiled by the Pacers for the 2017-18 season. This will be the third season of Hickory Nights recognizing legendary Indiana teams, coaches, players and cities while commemorating Hoosiers. Previous honorees have included Crawfordsville, the birthplace of Indiana basketball; Indiana high school's all-time leading boys scorer Damon Bailey; Indiana’s first Miss Basketball Judi Warren and state championship teams from Marion, Indianapolis Crispus Attucks, Indianapolis Washington and Milan, whose 1954 state title inspired the film. Friday, Nov. 17, Pacers vs. Detroit: The Indiana Basketball Hall of Fame and the City of New Castle. As home to the Hall of Fame and Chrysler Fieldhouse, the world's largest high school gymnasium (capacity 9,325), and the annual holiday Hall of Fame Classic, New Castle occupies a special place in Hoosier basketball history. New Castle also produced basketball All-Americans Vern Huffman, Kent Benson and Steve Alford, currently the head coach at UCLA. Monday, Jan. 8, Pacers vs. Milwaukee: John Wooden. Wooden first excelled as a player at Martinsville High School and Purdue University, where he was a three-time All-American. His coaching career began in South Bend, moved to Indiana State University and then to ULCA, where the "Wizard of Westwood" guided the Bruins to 10 NCAA national championships in 12 years. His Pyramid of Success is a staple for both basketball and life. Sunday, Feb. 11, Pacers vs. New York: Paul D. "Tony" Hinkle. A native of Logansport, the revered Hinkle, a member of the Naismith Hall of Fame, coached basketball, football and baseball at Butler for nearly a half century while also serving as athletic director. The Hinkle "coaching tree" of former players and assistants remains a presence throughout Indiana and Butler's iconic fieldhouse is named in his honor. Tuesday, April 10, Pacers vs. Charlotte: IHSAA State Champions. The Pacers' regular season-ending game will include the recognition of the four girls and four boys IHSAA State Champions, continuing a Hickory Nights tradition. "We are excited to continue with Hickory Pacers Nights for the 2017-18 season. 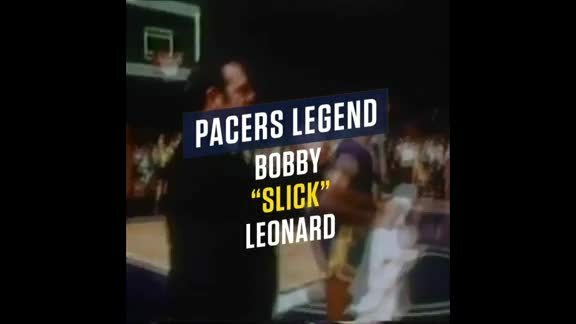 The platform allows us to recognize the people and places that have made the game of basketball synonymous with the state of Indiana," said Todd Taylor, chief marketing officer for Pacers Sports & Entertainment. Fans can learn more about Hickory Nights, the new Nike uniforms and also secure tickets to Hickory Nights and all other Pacers homes games at Pacers.com/Hickory.